The highly-reflective heat shield can be installed between the catalytic converter, muffler, or any other component to reflect radiant heat away from the undercarriage of the car. The Muffler/Catalytic Converter Heat Shield is made up of woven silica with a flexible Mylar finish that protects against radiant heat up to 2000 degrees and can withstand direct continuous temperatures of 750 degrees Fahrenheit. Thermo-Tec Cool It Fire Suppression Blanket (180043). Thermo-Tec Cool It Fire Suppression Blanket. Made from 100% silica yarns especially designed for high temperature conditions, it resists most acids and alkalis and will not mold or mildew. Thermo-Tec Cool It, Kevlar Muffler Cover (180040). Thermo-Tec Cool ItKevlar Muffler Cover. Handles continuous temperatures up to 1100deg F. Reduces radiant heat inside vehicle. Dampens muffler noise and vibration. 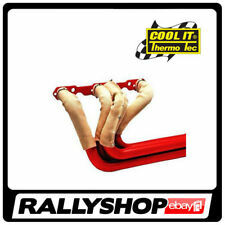 Thermo-Tec Cool It Header Manifold Blanket - for V6 and V8 engines (180007). The fabric side of the material should be facing the heat source and can withstand direct heat up to 750 degrees Fahrenheit. Thermo-Tec Cool IT Wrap Acid, Heat, Thermo-isolating barrier. Thermo-Tec "Cool IT" battery wrap acid absorbing heat barrier. 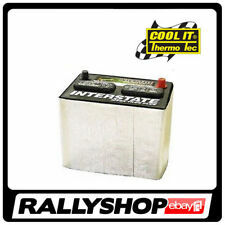 Thermo-Tec Cool It Thermo-isolating cover for battery (180029). We have been trading in the Motorsport industry since 2006. Use it wherever you need a secure, long-lasting, easy-to-apply bond. It is available in a generous 16.75 oz. Thermo-Tec's new Heavy-Duty Spray Adhesive is perfect for use with these Thermo-Tec products - new Thermo-Guard FR, the Cool-It Insulating Mat and the Aluminized Heat Barrier, but you don't have to limit its use to these products! 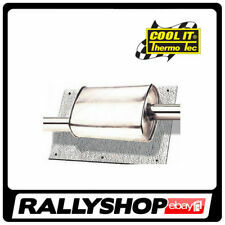 Thermo-Tec Cool It High Velocity Exhaust Jackets (for 8 cylinders) (180039). Thermo-Tec Cool It Header Manifold Blanket. The jackets cover the tubes vertically allowing for a consistent fit. 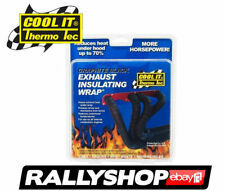 Thermo-Tec Cool It Exhaust Wrap Roll - 25mm x 15 m (180067). Wrapping headers maintains hotter exhaust gases that exit the system faster through decreased density. Increased exhaust scavenging is produced, along with lower intake temperatures. When used to retain heat in applications such as exhaust manifolds, the barrier is installed with the fabric side facing the heat. 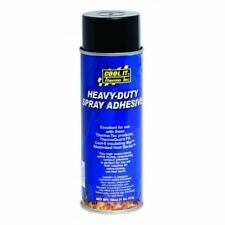 Thermo-Tec Cool It, Kevlar Heat Barrier Matt (180042). The Kevlar Heat Barrier is made from Kevlar with a Mylar finish. 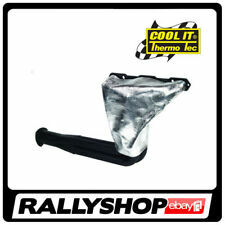 Thermo-Tec Cool It High Velocity Exhaust Jackets (for 4-6 cylinders) (180038). 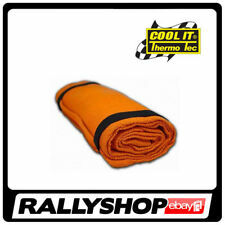 Thermo-Tec Cool It Header Manifold Blanket. The jackets cover the tubes vertically allowing for a consistent fit. Sound & Heat Insulation Mat. One Sided Foil. Picture for illustration purposes only. Actual product may differ in appearance. We accept all major Credit and Debit cards. We will not accept responsibility for parts ordered incorrectly. THERMOTEC 11710 Thermo-Tec Micro Louver Air / Heat Shield 12" x 24"
We accept all major Credit and Debit cards. Picture for illustration purposes only. Actual product may differ in appearance. We will not accept responsibility for parts ordered incorrectly. Cooling & Heating. Thermo-Tec 15003. The key to turbo performance is to keep a flow of high temperature exhaust gases moving through the exhaust side impeller. Turbo Insulating Kit, Insulation- Cover Only - Universal. This complete kit, to contain the heat produced by a turbo, fits a wide variety of turbines. Part # 11152. Wrapping headers maintains hotter exhaust gases that exit the system faster through decreased density. Increased exhaust scavenging is produced, along with lower intake temperatures. Exhaust Insulating Wrap withstands continuous heat up to 2000°F, and contains no asbestos.